A two-day activity-filled break in Killarney was just the answer for the Beyond The Glass team last week to blow off the office cobwebs. 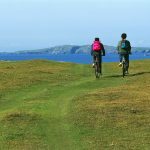 Biking, hiking and surfing in Ireland’s Kingdom county of Kerry located on the rugged south-west coast of Ireland, more fondly known today as the Wild Atlantic Way. County Kerry features in a lot of our Beyond The Glass 2017 Tours and is a real favourite with all our customers. 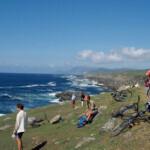 This blog should give you a flavour of what you’ll experience on one of our tours. 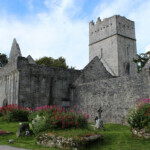 When you arrive into the town of Killarney you quickly see why it is one of the top tourist destinations in Ireland. It is surrounded by Mountains and Lakes. It’s beauty is breath taking and naturally spectacular and there’s an infectious buzz that makes it a perfect destination for an adrenaline filled adventure tour. 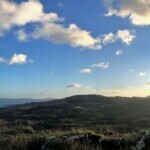 The town itself has some amazing restaurants and great shopping, and the expanse of the adjacent Killarney National Park has endless options for activity. 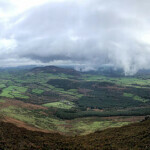 Starting with a Cardiac Workout up Torc Mountain. Torc Waterfall was our starting point, approximately 7 kilometers outside the town. We ascended the locally known ‘cardiac steps’ towards Torc waterfall, a name derived from the annual adventure race that sees athletes running up these steps. We took the gentler option of walking the steps to arrive to the top of the picturesque Torc waterfall. 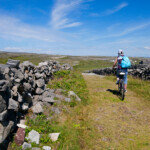 Leaving the bulk of the Tourists behind we then ventured onto the Kerry way. Walking in the shade of ancient oaks until the path led to open Mountain. 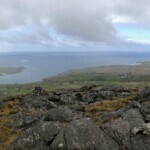 The Kerry Way carried on in a south westerly direction but we veered North West to climb to the top of Torc Mountain. On the summit, although just 535 meters high, we were greeted by splendid views of Killarney’s lakes and the McGillycuddy Reeks beyond. Following a relaxed and very tasty lunch we took to our bikes to explore the nineteenth century Muckross House and its adjoining gardens. The House and Gardens are set within the larger Killarney National Park and have extensive pathways which are perfect for a gentle cycle. We peddled through the Park while taking in the full beauty of the House and Gardens. 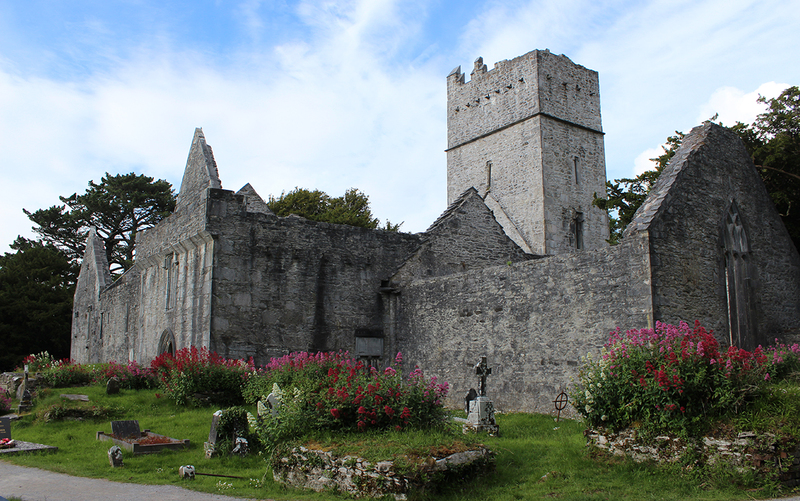 The gardens run up to the shore of Muckross Lake, the lake side path which circles the lake makes for a lovely shore side cycle; today we chose to explore the ancient ruins of Muckross Abbey, an old Irish Monastery. The evening light and wild flowers that grow between the fallen stones brought an air of wonder about the place. After a quiet moment at the abbey we took the cycle path that links the park to the town of Killarney and cycled the 7 km to the 15th century Ross castle. The once chieftain stronghold looks very impressive. It stands on the edge of Lough Leane and beyond are Purple and Tommies mountains giving the perfect back drop. The evening was drawing to a close but there still were a few people on vacation exploring the park. 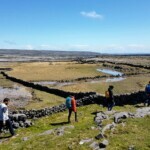 To get back to the town we entered the section of the park beside Ross castle and cycled the short few kilometers past the wild deer that freely roam the park and the rare breed Kerry cow that has been preserved in the area. 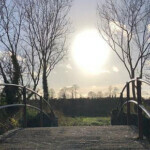 As we settled into Killarney for the night we looked forward to the prospects of the next day’s adventure in Dingle.